Book News: Wis. Governor Takes Heat Over His Choice Of Ghostwriter : The Two-Way Also: Barnes & Noble giving away free e-readers this week; Marjane Satrapi on Persepolis; and a teenage Hemingway's dimples. Wisconsin Gov. 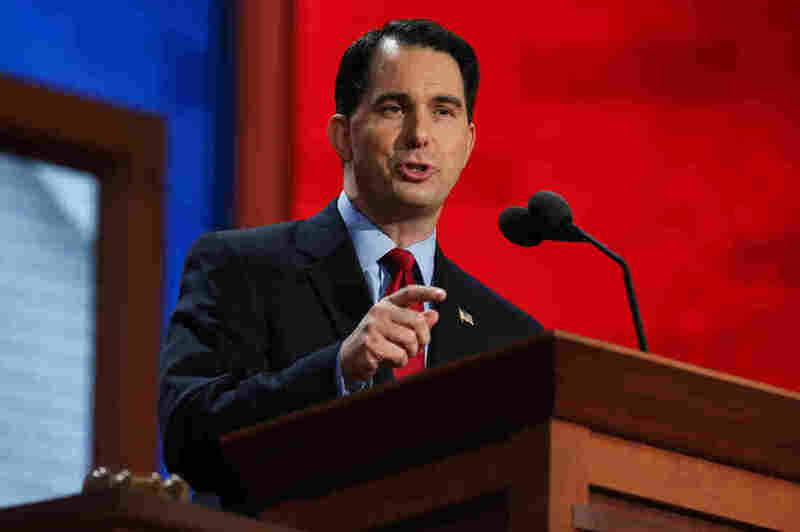 Scott Walker speaks during the Republican National Convention on Aug. 28, 2012. Wisconsin Gov. Scott Walker is being criticized for hiring Marc Thiessen, a journalist and vocal supporter of "enhanced interrogation techniques," to ghostwrite his book. The National Review, citing anonymous sources, broke the news of the collaboration Monday afternoon. Thiessen was a speechwriter for President George W. Bush and Donald Rumsfeld, and an adviser and spokesman for Jesse Helms, the late North Carolina senator who opposed civil rights for blacks and gays. In The New York Review of Books, Emily Eakin quotes feedback on an exam taken by French philosopher Jacques Derrida when he was 20: "An exercise in virtuosity, with undeniable intelligence, but with no particular relation to the history of philosophy....Can come back when he is prepared to accept the rules and not invent where he needs to be better informed." Barnes & Noble is giving away Nook Simple Touch e-readers for free this week. Anyone who buys a Nook HD+ tablet will receive an e-reader. As Reuters noted, this seems like "a sign [Barnes & Noble] may still be grappling with excess inventory of the unpopular e-reader." Marjane Satrapi speaks to WBEZ's Afternoon Shift about the controversy over her graphic novel Persepolis being pulled from some Chicago classrooms: "It seems like something completely surreal to me." Flavorwire collects pictures of famous authors as teenagers. Hemingway's dimples are pretty darn cute. Self-publishing is officially cool: Actor Jim Carrey said of his new children's book, "I'm going to self-publish, because that's just the world right now and I think it's cool."